Casual clothing could be colorful and expressive, if you have any doubts about it, then you should check the collections by Blomor. The garments of this designer are of street style with sports look. Produced with graphic motifs and the cut of the clothing, these garments attract customers’ attention. There are a lot of vintage photos, pop culture prints and other urban style details. The collections of Blomor include hoodies, vests, shorts, sweatshirts and so on. Starting from the year 2004, customers have all the chances to enjoy real Italian creativity and street style in clothing. This is a kind of brand, which is able to present innovative, original clothing, which can not be associated with any other designers and would contribute to creating your own individual style. People should be happy, when wearing their clothing, they should feel comfortable physically and morally, this is what is granted by this designer. Crew neck sweatshirt with contrast sleeves and print on the front with Elvis and hamburger would become one of the brightest sweatshirts in any men’s wardrobe. It could be worn with denim trousers or with sportive trousers. It adds originality and style to the whole image. 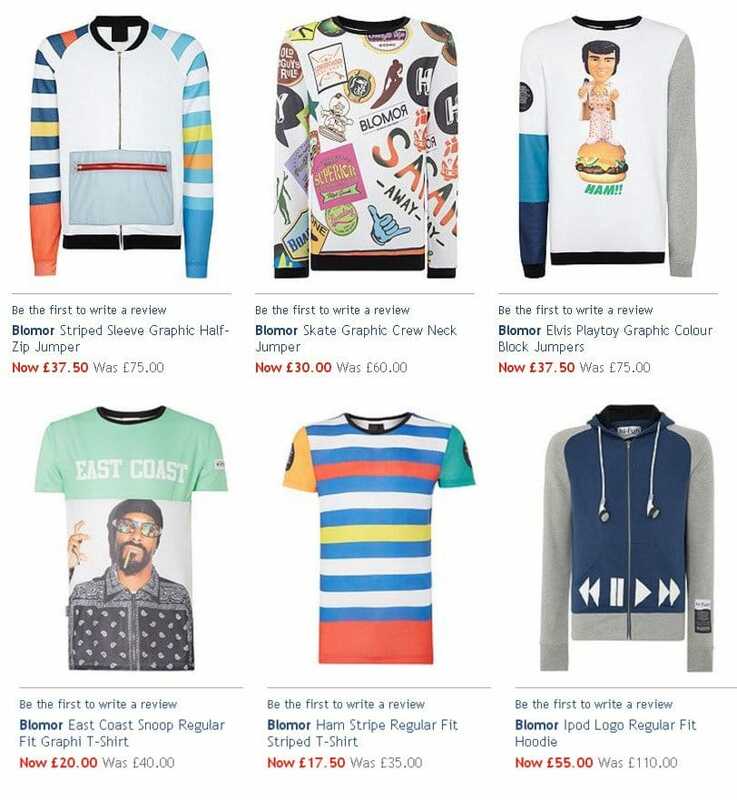 For younger guys there is Blomor graphic t-shirt with SNOOP printing on the back. This is a versatile t-shirt, which could be well matched with denim trousers or with your favorite chino trousers. It is made of 100% polyester with crew neck. For summer time sweatshorts with an all over print of skate badges and icons are just perfect. There are two pockets and a draw string for proper fixing. Made of 100 % cotton, they are ideal for letting your body breathe. They are multicolored and could be worn with any t-shirt for making the outfit complete.